I spent nearly two years focused primarily on one thing: to travel to Laos for the first time. When I finally went this February, I felt like the whole of my life had built up to that moment. I don’t know how I can describe the enormity of the experience with only words, but I want to try. In the months prior to my travel to Laos I became very interested in current events there. 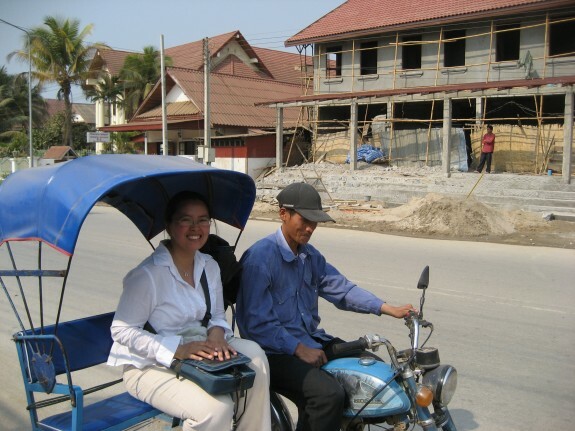 I did a great deal of informal online research and listened to Lao language radio broadcasts. I grew up in a very close-knit Laotian community in California and fell in love with the big parties and great music, so in preparation for the trip I also researched modern Laotian music. Thanks to You Tube I was able to watch endless videos clips. Over the years I read and acquired several books on Laos, but a compact travel guide and a Lao-English English-Lao Dictionary were the only ones I finally packed. My meticulous preparation and self discipline was in many ways an attempt to minimize the most significant event in my life until that point — my mother’s passing about two years ago. Her absence left a gaping hole inside of me and I felt I needed to find her. I needed to find who she was before I knew her, and I needed to know what she felt each time she returned to Laos. Prior to that point, I never felt quite ready to go. I always felt an enormous need to be accomplished in some way. Time was not waiting for me to feel ready. My first impression of Laos was Luang Prabang. The people of Luang Prabang speak with a different accent than people from southern Laos, where both sides of my family are from. Nonetheless, they recognized my every word and I felt immediately at ease with theirs. Luang Prabang has a very important place in the history of Laos, and the entire city was appropriately designated a World Heritage Site. Luang Prabang is home to the former Royal Palace (now National Museum), amazing Buddhist architecture, and is surrounded by lush mountains, rivers and waterfalls. Luang Prabang is also a city experiencing rapid growth. New construction projects are everywhere. Visitors hail from all over the world. At the night market village vendors and tourists pack the streets. I enjoyed the historic sites and natural beauty, as well as meeting genuinely friendly people. I noticed many young people working in various positions throughout the city. They were all very welcoming and helpful, often referring to me as “older sister” — a familiar term of respect that really touched me. Growing up in America and being old enough to recall the cold war, anticommunist sentiments were firmly imprinted in my mind. As a student of history I came to Laos with all the baggage of the Vietnam War. Although my parents traveled back to Laos many times before, I felt that my western education put me in a position of responsibility to help make progressive change happen. I was very moved when a taxi-cab driver said how important it was for people like me to come back to visit Laos. He reassured me that I was doing the right thing. In Vientiane I met up with my cousin and his fiancée who were working and studying there. My boyfriend and I received a tour of the capital city on the backs of their motor-scooters, shooting through traffic, circling government buildings, temples and historic monuments. That Luang was much larger that I had imagined from the pictures. In fact the entire city felt larger and more real than any of the countless pictures I had seen or books I had read. When a family friend joined us one evening and the conversation veered into current events and politics, I started to feel tremendously self-conscious. We talked about the recent military coup in Thailand and the role of their King. She pointed out that Laos was a more true democracy of the people. I could have mentioned the hypocrisy of their single party dictatorship and the need for a multiparty system in a true democracy. Yet, at that moment I could not find the words to counter her. In contrast with Thailand’s troubles, Laos did seem more stable. My final destination in Laos was a few hours outside of Pakse. I was to visit with my paternal grandmother, who lived with my family in the U.S. briefly, but chose not to stay. Her return to Laos had always puzzled me, until now. As we traveled south, my Anglo-American traveling companion became sort of a celebrity for the day. Women and children looked on with gentle curiosity as we crossed the Mekong River by ferry and traveled on dirt roads. I had stressed out over how my relatives would receive my unmarried status and American manners. There was so much I wanted to explain. There was so much I wanted to tell them. However, seeing my grandmother again only brought a flood of tears from both our eyes. None of the other business mattered. There was nothing I needed to clarify. I was just coming home. Even though it was a home that I had never been to, I was welcomed at every corner by familiar faces. Everyone in town seemed to know each other well. Coffee was served with complementary tea. Rice wine was served with almost every evening meal. Shopkeepers delivered packages to homes without address details. Postal mail did not even require a last name. While plumbing and electricity was not always reliable, almost everyone had access to satellite TV. I was caught by surprise one night when Global Warming became a casual late night debate. I started to mention the burning of trash and forests in less developed countries, but my relatives quickly reminded me of the industrial pollution caused by U.S. corporations. As I listened to my aunts concerns about America’s intrusive military presence in Iraq and other parts of the world, I soon lost the heart to advocate any sort of western model of so-called progress. It was not that I was discouraged from wanting things to be better in Laos, politically and economically. It just became apparent to me that change in Laos was already happening, with the impetus coming from within. Rapid exposure to international media and interaction with people visiting from abroad effected enlightened discussions in all parts of the country. The Laotian people I encountered were all well informed, open minded, and far from naive. I realized that my responsibility was not to help them understand the outside world, rather it was to help myself understand their world. I always envied Thais, Europeans and others who traveled to their ancestral homelands without fear of persecution or attack. Now it was finally my turn. Traveling to Laos this time was just the beginning. I traveled to Laos to find something I thought I had lost. What I discovered was an expansive place where people shared my culture and heritage. The cabbie had it right. I do need to go back, even if just to proudly speak mother’s language in my father’s country once again. I wrote this article in the fall of 2007, after returning from Laos for the first time. I married my “traveling companion” Adam Thorsen the summer of 2009.